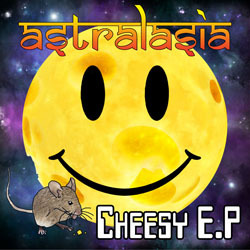 Astralasia's Cheesy EP features five tracks of fun and uplifting music. Some are new, some are not so new. Track 1 is a brand new track written by Astralasia main man Marc Swordfish and vocalist Maria Szabo, incorporating the well known 'whistling' music from The Seekers 1960's classic "Georgy Girl". The result is a new unique track that will bring a smile to anybody that remembers Georgy Girl as well as those who don't. The second track is a brand new version of Astralasia's own classic trance jig "Sul-E-Stomp" which was a club favourite when released in the 1990's. This new version brings it bang up to date. Then comes a version of John Leyton's "Johnny Remember Me" which was originally recorded for a now sold out 7" vinyl EP released on the renowned Fruits De Mer Records label in 2014. This track had great reactions when it was first released, including plays on BBC 6 Music. Next is an uplifting trance version of the Space classic "Magic Fly". This is a rare recording which was originally included as a bonus track on Astralasia's Mother Durga single. The EP is then rounded off with a brand new dub track, "Johnny In Space". Marc Swordfish commented - "I always like to experiment in music working on many different styles. I'd created Happy Song as a bit of fun and thought this didn't quite fit in to the new albums that I am working on. However I played it to a number of people who thought it was great and said that it should be released. So I thought I'd put it on an EP and combine it with some other fun one-off tracks, hence the name - Cheesy EP."